Wait! Do not confuse this plantain with the green skinned cousin of bananas. This is a weed or an herb that you can find in temperate climates. There are over 200 species of this herb and you can locate one or more of them even in your lawn! A traditional cure for various skin conditions including sunburns and eczema, this herb is known to have rich antibacterial and antiseptic properties. It is the leaves of this herb that gives you the benefits. If traced back to the 1500s, you would be able to find that this leaf extract used to be a cure for various health conditions, including flu and fever. Packed with tannins, aucubin [an iridoid glycoside], and mucilage, the plantain leaf extract is known to have expectorant and anti-irritant properties as well. So, do you want to know more about plantain-the herb? Read on plantain herb benefits here! Taking care of our skin involves much more than a skin care regime! A truly beautiful skin is the one that is healthy from the inside. Plantain does just that! Extract the juice of fresh plantain leaves and apply it to the affected region. You can also make a poultice by crushing this leaves with cool water for similar benefits. While the anti-inflammatory nature soothes the burning and rashes, antibacterial properties prevent itching. The extract of these leaves of this herb contains certain elements that ease the itching, inflammation, and soreness associated with insect bites and bee stings. Thus, it soothes down the skin, promoting faster healing. 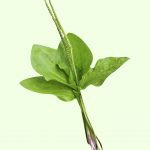 Allantoin, an ingredient present in plantain leaf herb, has germicidal and antibacterial properties. Thus, when applied to the wounds topically, this herb helps in killing the germs. It induces quicker healing, and triggers the synthesis of skin cells. A mixture of cayenne, comfrey, and plantain leaf extract is known to invigorate the skin regeneration process. This, in turn, reduces the chances of scarring on the skin due to wounds and blemishes. Inflammatory skin conditions, such as acne and rosacea get benefits from the topical application of this cooling herb extract. Along with easing down the inflammation and preventing the region from infections, this herb also prevents scarring by inducing faster healing and regeneration of skin cells. As mentioned above, this herb is known to possess anti-scarring properties. Studies suggest that one can use this regularly as a supplement, especially if one has pimples or acne to clear off the blemishes and keep the skin glowing. Plantain can be used as a hair rinse. A string concoction made with the leafs of this plant along with a teaspoon of apple cider vinegar, and a little water, if required, makes an excellent hair rinse. Plus, thus herb tones down the pungent aroma of vinegar too. This herb has been touted as an effective remedy for dandruff and flaky scalp since time immemorial. The antiseptic and antibacterial properties of this herb shield your scalp from infections and offer relief from dandruff. Mix the extract of plantain leaves with a little almond oil and beeswax. This mixture can be used as an effective antidote for diaper rash as well as mosquito bites for babies. Roll a cube of ice in a leaf and use it to massage the baby skin. This will ensure that the skin is free of rashes and inflammations. It also increases the suppleness and smoothness of the skin. Studies suggest that the anti-inflammatory nature of this herb enables it to soothe the inflamed respiratory tracts and bronchial passages in events of cold, bronchitis, and flu. An ideal dose is 1 tsp of the extract thrice a day. A cup of plantain tea is known to soothe the irritated mucous membranes, offering relief from cold and cough. It offers an effective treatment for blood poisoning. You can either use it topically as a poultice or drink it as tea to experience the benefits. It is a natural cure for inflammatory conditions affecting the urinary bladder and kidneys. Being a natural diuretic and a demulcent, it enables frequent urination, thus eliminating the toxins from the kidneys and bladders. It is also effective in easing edema conditions in various health issues. It can also be used as an effective cure for bed wetting in babies. The styptic properties of this herb enable it to be used in cases of minor bleeding. Just chew the leaf or make a paste of it to be applied topically on the bleeding zone. Studies suggest that this herb can be used for faster postpartum recovery. While the styptic nature helps in controlling the bleeding, this herb is also known to aid in the elimination of placenta. It is known to have positive impacts on controlling the cramps associated with postpartum recovery. 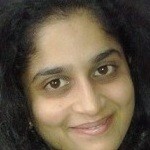 It also helps in toning the uterus after child birth. 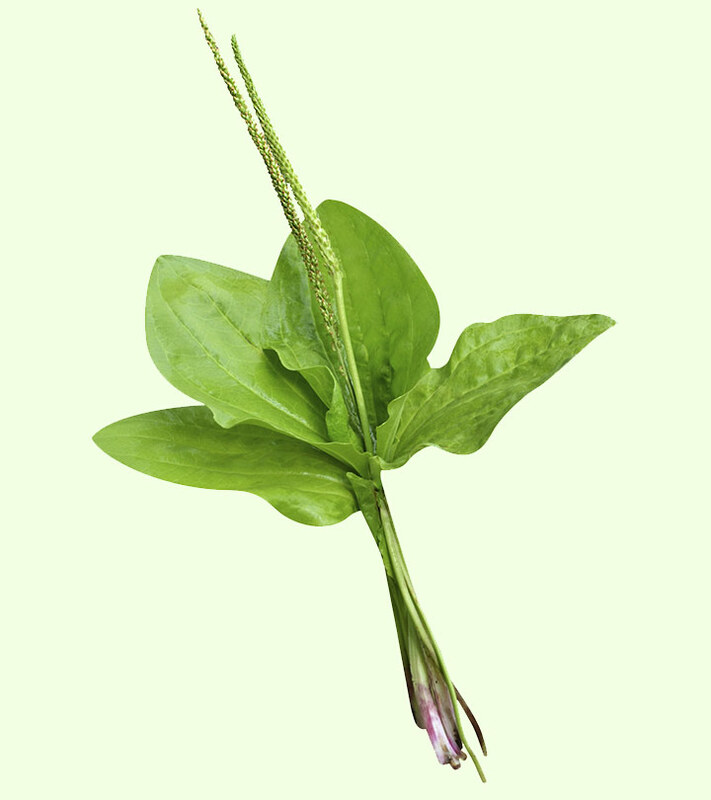 Plantain is an effective antispasmodic, which enables it to be used during painful periods to ease menstrual cramps. One can also use plantain to stall heavy bleeding during periods. Drink a cup of tea or use the leaves in your salads to ease the inflammation troubling your tummy. It also helps in improving the digestive fire and even combat constipation issues in a healthy way. An effective cure for diarrhea, plantain leaf tincture is an effective remedy for gastric ulcers, bowel ulcers, dyspepsia, and dysentery. The anti-inflammatory nature of this herb is quite well known. This enables it to function as an anti-cancerous and anti-tumors agent too. It slows down and represses the growth of cancerous cells and tumors, thus being quite efficient in easing and preventing the spread of this malignant condition. This herb is known to possess diuretic and detoxifying properties. It also has appetite suppressant properties, which helps in curbing hunger pangs to a great extent. Just ingest 3 grams of this herb with 250 ml water half an hour before each meal, restricted to a maximum of three times a day and watch the weight melt away. This herb can be used, both externally and internally to treat tuberculosis and syphilis. Studies have pointed that this herb has the potential to lower triglycerides level and keep them under required amounts. It is also known to lower LDL cholesterol, improve HDL cholesterol, and maintain the balance between the two. When all these elements are under control, then there is a reduced risk of various cardiovascular health issues. This plant rarely seems to give any negative reactions and is quite safe to be used. However, always make sure that you follow the recommended dosage to reap maximum health benefits. Have you ever tried using plantain as a natural remedy for any health conditions? What was your experience? Share with us right below in the comments section.